An independent singer-songwriter’s journey is often a voyage across choppy waters, mixing moments of creative inspiration with mundane funding pressures and forever keeping an eye open for new opportunities. 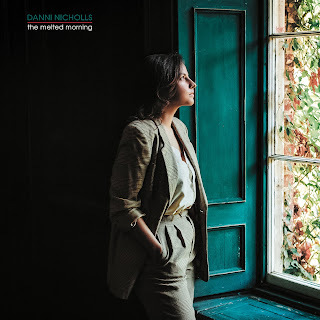 There is no doubt the journey of Danni Nicholls’ new album THE MELTED MORNING has followed a similar path from idea storming to the brink of release. The pinnacle moment of this bold venture is in touching distance as the finished piece banishes all barriers and eleven songs become freely available for all to listen. The result will not disappoint existing fans and firmly places one of the UK’s leading proprietors of heartfelt singer–songwriting fare at the point of maybe a significant potential breakthrough. This last point is really for tomorrow, as today needs reserving to revel in a seriously classy set of songs that open an exciting new chapter for Danni Nicholls. Those au fait with her previous work will instantly feel a change, albeit one that complements a past where the sound was a little less intense than a fuller bodied one seemingly engineered by a link up with American producer Jordan Brooke Hamlin (Indigo Girls, Lucy Wainwright-Roche). The feel of breezy past numbers like: ‘Hey There, Sunshine’, 'Travellin' Man' and ‘A Little Redemption’ remain in the locker as the serious introspective ballad takes over. These range from the sleek and slender ‘Wish I Were Alone’ to the powerful Ben Glover co-write ‘Frozen’, and probably peaking with the soulful gospel vibes powering the uplifting ‘Hear Your Voice’. The mention of the co-writer in the middle of this trio of tracks is a key feature of the album as Danni has sought seven excellent peers to lend a hand in this piece of the process. Robby Hecht and Kyshona Armstrong were the collaborators on the first and third of this trio, with Glover featuring on two further songs, and the talents of Jess Morgan, Jaimee Harris, Amelia White and Jon McElroy utilised elsewhere. Many of these are long-term favourites in their own right here, and could only enhance any project to which they contribute. While Danni is keen to co-operate on the writing front, she absolutely owns the vocal zone with her own rich distinctive voice bestowing each song without the need for widespread harmony enhancement. To signify a multi-dimensional approach, three solo writes make the cut, each having a presence on different fronts. ‘Ancient Embers’ surfaced in the embryonic days of this project, introduced as a brand new track during a Birmingham gig in 2017. The version that night given the thumbs up; a view maintained upon now reaching recorded status. ‘Lemonade’ revolves as one of the more interesting tracks on the album, while ‘Hopeless Romantic’ finds its ideal slot as the curtain closer. The latter is a belter of a minimalist country-style ballad, giving a reminder that Danni is at least inspired by country music, if not necessarily guided by it. Indeed the whole feel of THE MELTED MORNING is one of contemporary singer-songwriter rather than a previously attached label of Americana. This record is not necessarily bound by a monster track miles ahead of the rest in terms of presence. ‘Power to Leave’ with a lovely rolling feeling to the chorus stakes a claim to be in the upper quartile for those of a certain frame of mind. ‘Wild as the Water’ is the brash opener signalling a move into new waters, while ‘Texas’ is a moving track that pricks your ear into serious lyric listening mode. The fact that a pair of strong numbers in ‘Losing It’ and ‘Unwanted’ have to fight it out to get a final mention explicitly defines the overall strength of the record. They both seamlessly fit into an entity that is beautifully balanced and arranged by the most acute of ears. Danni Nicholls has recorded many fine songs in her string of previous releases to stand the test of time. THE MELTED MORNING, whilst being a giant leap forward, does not overshadow them, rather demonstrating the adaptability and evolution of a recording artist. This stunning collection of tunes will resonate deep into a community of likeminded listeners and likely court favour with those active in the award nomination game. More importantly, it branches out and opens up a new world that will no doubt create exciting opportunities. These will be richly deserved.